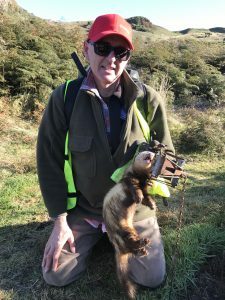 Introduced mammalian predators pose a serious threat to all New Zealand animals including penguins. Predation from invasive mammals is now managed via trapping at many breeding sites across the penguins range. A suite of traps and baits can be used, depending on the target predator. The Trust maintains trap lines at all of our reserves, which are checked weekly during the penguin breeding season and less frequently (2-3 weeks) during the rest of the year. The most widely used traps on our reserves are DOC 200s and DOC 250s, targeting rats and mustelids, with smaller numbers of Mk6 Fenn traps, which are gradually being phased out as they reach the end of their operational lives. Possums are targeted using Timms traps and Goodnature A12 self-setting traps. Feral cats are trapped with Steve Allan cat traps. Our trapping programmes are carefully designed to ensure that the traps are effective for the site and that they are “penguin proof” i.e. do not catch protected species. This means that traps are set in tunnels to prevent access by non-target species, fixed to the trunks of trees or placed outside the penguin breeding areas.